What do YOU need to do to help your bees survive the winter? The Number 1 most important thing to do is to make sure you have bees that CAN survive the winter! Buy the southern package by ALL means! But then replace the queen with a local or northern queen when they are growing well. #2 Make sure they have enough stores! The amount of reserves they need is entirely dependent on your location. In Southern Texas they may not need anything stored away because they never HAVE a true winter.. In Canada they may need 120 to 150 lbs.. Where I live, my bees need an average of 100 lbs of honey. Average is NOT the safe number for you to go by. The sad truth is, you don't. So you prepare for the worst. If the worst does not happen your covered, if the worst DOES happen, your STILL covered! #3 Make sure your bees are Mite and disease free. #4 Make sure they have a home that will not kill them. Condensation, Dripping onto the cluster will kill your bees. Insulate the top of the inner cover to prevent this. If you have those 4 things covered, your bees have an EXCELLENT chance of surviving the winter. What about Wrap? Upper entrances? Winter patties? What about all that other stuff? All that other stuff is insurance. Things WE do to make US feel better, and give the bees a better chance if things go horribly awry. The winter of 2013/2014 was a perfect example of the need to prepare for the worst here in SE Iowa where I live. It got COLD by the end of November, and STAYED cold until the middle/end of February. COLD.. -20 and 30 to 40 mph winds.. Winds in excess of 50 mph a time or two with temps nearing - 25, which put wind chills colder than -50.. My bees survived by the grace of god, and simple table sugar. It was so cold, the bees could NOT break cluster and get to the honey on the outside frames and corners.. they chimneyed right up through the middle of the hive to the top, where they encountered the sugar I had left for them.. "Just in case." At which point they eagerly dug into that sugar and began eating it. When I finally was able to check on them, I found half the sugar gone, and all the hives alive and well. THIS was the point I began to hear about how many losses nearby beekeepers were experiencing.. By May, I learned that we had an average of 70% losses in this state. I lost a single Dink I expected to lose. Not because I am an AWESOME beekeeper. My hives survived, because I was prepared for the WORST case scenario right from the moment I prepped and closed up my hives for winter. Let me talk about the insulation and inner cover to start out with. I recommend the foam insulation be in contact with the inner cover surface as seen to the left. This prevents cold air from getting between and causing the dreaded condensation. As you can see, the foam raises the tele cover enough that the top entrance is unrestricted. Why do I want the top entrance unrestricted? Two reasons. First, ventilation. Allowing some of the warm moist air to escape, taking the excess moisture with it. Second, because with the winds we have here on the plains, the lower entrances are often Blocked.. Clean them off and fifteen minutes later they are blocked again. Put a windbreak to stop that, and you will find your hive BURIED in a 12 foot snowdrift. I am using a little different Inner cover This year. Tim Wilbanks showed me one he had built, and I liked it, so built a few to try. I will be swapping ALL of my inner covers for these. You can see more about them on my inner covers page in the do it yourself section. Basically, for winter, I turn the cover over so the 2" depth side is down. Allowing SPACE for sugar or sugar cakes, pollen patties in spring etc... The Foam is trimmed to set firmly ON the inner cover.. I remove the jar lid, and the bees leave the foam alone. If your bees do not, you can always tape the hole to prevent them from chewing on the foam. So with the 2" side space down, the foam on top, and the tele cover on top of that, this is what we have.. I will Tar paper this, and cut the hole for the top entrance. Contrary to popular belief, the tar paper is NOT for insulation or drafts. Its SOLE purpose, is for solar gain on those moderate days that the bees would JUST not have been capable of breaking cluster.. The tar paper will allow them to move to food on more occasions than if the hive were NOT wrapped. Tar Paper = Solar Gain = More opportunities to move to reserves. In the past, I have always placed newspaper on the top bars and poured sugar directly onto the paper as part of my winter prep. Last winter I tried using sugar cakes on a few hives, and found that they worked as well as the granulated sugar, in fact, all they really do is skip a step in the process..
As I would normally pour sugar onto the paper, I would mist it lightly as I poured, and this, would, in effect, create a sugar block. Now, I make the sugar into blocks ahead of time. It takes very little water to make a sugar cake/brick. I will dribble a little water into my sugar, and use the mixer to distribute the moisture. When I am certain I have an evenly moistened batch of sugar, I dump it into a turkey roasting pan, spread it out, and press it down. I make the thickness, or depth of the sugar about 1 to 1.5 inches, and score a line across the middle of the pan. This will be where I break the block when it is dried. Then I put the pans in the oven, set the temp to 200 degrees, and leave the door cracked JUST slightly. I leave it in there two to four hours.. then shut the heat off, and leave the oven light on over night. The next morning the cakes can be removed from the pans.. They will STILL be easy to break, so use care.. they will continue to harden as time passes.. These cakes will still absorb moisture from the hive, just as the granulated sugar will, but seem to leave less of a mess to deal with in the spring. The advantage is, they can STILL be used to make spring syrup if the bees do not consume them all, or perhaps, do not even touch them if you have a mild winter. No waste, no worry. In the event I have not made enough cakes, I ran out of time or my wife threw me out of the kitchen before I was done.. I resort to the newspaper and loose sugar.. It is in fact faster than making the bricks, but takes a bit more clean up in the spring... but, you were going to scrape the bottom boards and clean everything in the spring anyhow... right? So.. Winterized hives. The appropriate amount of reserves of honey and FED medicated syrup (See Treating your bees) capped and ready for use. Sugar or sugar cakes on top. Foam insulation in place, Wrapped with tar paper. Lower entrances reduced to 3" by 3/8. 3/4" x 3/8 upper entrance open. This is how I winter my hives. It gives me the confidence I want if I do not get a mild enough day to PEEK into the hives for four months. I have never lost more than three hives during a winter. Even a HARSH and LONG winter. I hope I can keep that record going, but now that I am wintering NUCs it may not be so easy. Under normal conditions, the bees don't touch the sugar on top. They don't even have time to chew the paper. I winterize when the nights are getting into the 30's and we still have some 50 degree days. On a bright warm day, they get winterized, and normally COLD sets in not long after. In early March, when the temps again approach 50 in the day, I can inspect quickly. I look for reserves, weigh the hive. I make note of the hives that are doing well, and I add sugar to the hives that are not doing well. By early April, the temps usually come up enough to allow me to do a good inspection. A 65 degree plus day. At that time, I remove the sugar from the hives that did not touch it and still have reserves. I begin putting my external feeders out, with syrup and pollen substitute in the lower trays. I take it in at night if its is going to get chilly, and put it out again the next morning. When night time temps begin to remain above 50, I start leaving the syrup out, and I remove the last of the sugar from the top of the hives. What didn't get used gets dissolved into syrup, so none of it is wasted. I check for mites, and treat as necessary. I clean out the deadouts, (Hopefully there are none!) and begin preps for splitting and re queening. The ONLY benefit to winter, is that it gives me time to make new equipment, and repair old. The method I use may not work for you. I know a Beekeeper that lives in Canada, and he winters his hives almost exactly as I do. He uses fondant patties instead of sugar.. I like the sugar, because it absorbs a certain amount of moisture. In a normal winter, the bees don't fuss with the paper, and so long as I leave them plenty of stores, they often don't fuss with the sugar either. It is insurance for my bees. Some I have spoken with RAIL against this method.. stating that they tried it, and ended up with a HUGE mess when the paper became saturated.. Apparently they have higher humidity than I do, or they do not provide enough ventilation. Using the cakes will also prevent that mess. Some have said they tried this, and their bees carried all the sugar OUT of the hive, shredded the paper and carried it out as well. Apparently they have warmer temps than we have here, allowing the bees time to get rid of something that is in their way. My bees don't usually have that time. Sometimes, on weak hives that I leave the paper/sugar on into mid April, they WILL begin to shred the paper and carry lumps of sugar out.. That is MY fault for not taking it out sooner. HOWEVER! I prefer to clean up the mess, rather than let my bees starve. Fondant, or commercial winter patties? I am sure they work well. I have SEEN both work well, but turning the unused portion into syrup to minimize waste isn't as easy, or is not possible at all..
A good YouTube vid of Michael Palmer talking about keeping bees in the frozen north. I probably follow his methods closer than any other. METHODOLOGY!! It all comes down to WHAT WORKS for you, where you live, the type of bees you have, and the WAY you wish to handle the situation. NOTHING is set in stone. If what you do works, then use it. LISTEN to what others have to say, but always take what is said with a grain of salt. Even Beekeepers a few miles apart will have different methods. Hearing that your neighbor does this, this, and this, SHOULD mean more to you than what someone 100 miles north or south of you does. The methods used by someone with three or four hives will not be the same methods used by someone with two hundred, or two thousand hives. Pay attention to the details and the location. If you LIKE what neighbor X does, give it a try on one hive next winter, and see how it works for you. MODIFY your methods, adapt the way you think/work, and never get overconfident, because the bees will show you the error of overconfidence quickly. IF, you have one or two hives, then your fear of losing them will be HIGH! 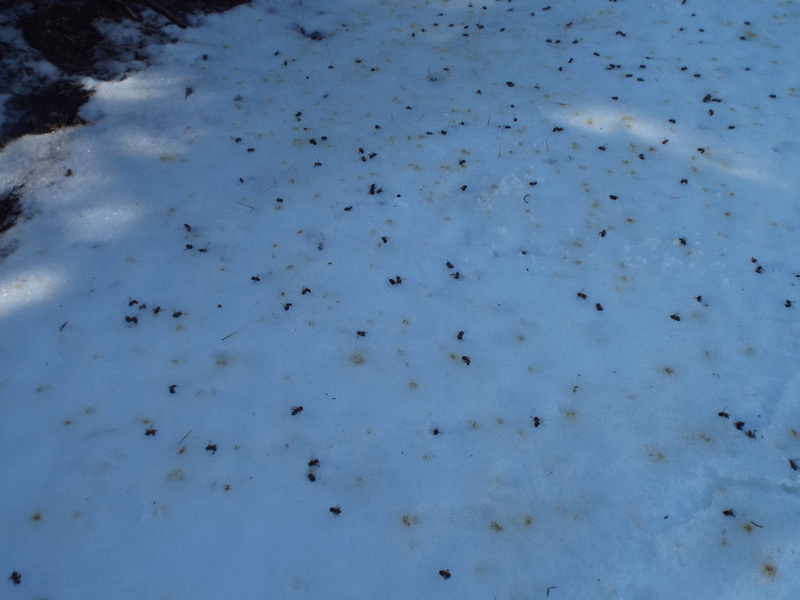 If you live in an area similar to mine, and your bees are capable of wintering where you live, then USE the method outlined to winter your bees. it will give them the best chance possible. 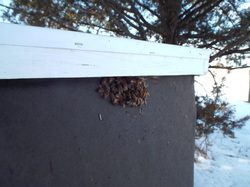 When you have three and a half months of sub ZERO temperatures, and then have a 50 degree day, the bees will be flying! Can you imagine not going to the bathroom for three and a half months? They will also be carrying out the dead, so if your going to check on your bees on a day like this, Take Mr. Palmers advice.. WEAR A HAT! Its 50 degrees and the bees are taking cleansing flights and carrying out the dead. It is ALWAYS GOOD to see they survived the winter and are READY for spring to arrive. Not all of them made it. This was the last of my southern Italian cross bees. The cluster was partially in the bottom deep, and partly in the top deep. The honey was completely stripped from the bottom box, the top box was still 3/4 full. The cluster was two inches from capped honey directly above them. THIS is what I mean when I talk about Bees that can winter. EVERY OTHER HIVE at LEAST went straight up. This last of the southern bees could not even do that. They DIED where they were when it got too cold for them. I have had SOME say it was MY fault they died, I should have prepared them better! Sorry.. NO! I will NOT proliferate bees that are this pitiful. If they cant winter they have no place in my apiary, or yours either! Yes, i could put 2" foam all around their hive, and put a heat source under the hive and somehow help them survive the cold.. But I prefer to instead keep bees that I do not have to mollycoddle. I "WILL" make an effort to insure they have ample stores, and that they do not have icy water dripping own on them. I will give them Fumagilin B to help keep Nosema at bay, and I will wrap the hives so they may have a few extra opportunities to MOVE to reserves. I will treat spring and fall for mites. No more, no less. The bees that survive with this treatment, will be proliferated. Again, I want to make sure you BEWARE of what you read and watch. The method I mention above works Here in Iowa. I know it works in Minnesota, Montana, Maine, New York, Vermont, and parts of Canada. I have spoken with beekeepers all across this country and in a few others. One general thing has come to mind.. They ALL like snow around and covering their hives. We do not typically get that much snow here, but do occasionally have big drifts over the hives. In such situations, it is easy for me to see the difference in survivability and the amount of stores used. Typically, the hives covered by the big drifts use less stores, and they survive with larger clusters as they come into spring. They did not have to fight the -50 wind chill that the un covered hives did. I would like to say here, what I said there..
"Perhaps in your situation, shoveling the snow away from your hives may help, but it does not help here, and is in fact quite detrimental." "ALL of my hives survived BECAUSE I shoveled them out!" No, his hives survived DESPITE the fact he shoveled them out. A new beekeeper might read his comments, and go running out, shovel in hand, and kill most of his hives. Remember, in the past, beekeepers put their hives in buildings, or basements for the winter to protect them from the wind. The bees do not venture out when the temps are below 40. Come spring, those beekeepers carried their hives back into the sunlight. Having snow over them will be much the same. Protected, insulated, but still cold so they remain clustered. When that bright February or March morning arrives where it will be warm enough for a cleansing flight.. THEN, run out there and shovel JUST enough snow away to open the entrances. Some modern beekeepers have "cold rooms" where they stack hives for the winter. The temperatures are kept at an exact level to keep the bees clustered, yet they do not have to deal with MUCH colder temps or wind chill. It works very well, but most of us cannot afford it. Use caution when reading and watching videos. When you have 20 people agreeing on a method, and ONE person adamantly swearing your bees will die, it is best to ignore the minority until You are confident in your beekeeping skills. I have lost too many hives in the past because of my experiments in trying things that "might" work elsewhere, that do NOT work here. Please use caution, Please talk to local beekeepers.. More than one of them, and keep your bees happy!